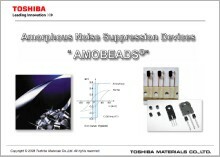 Introducing DY series as new AMOBEADS, "the decisive answer to noise suppression". Improvement in device design realized high cost performance with the same properties as current AMOBEADS. The area of usage has expanded to consumer electronics because of the excellent advantages in cost and noise suppression. Superior Noise Suppression over RC Snubbers and Ferrite Beads. Can be used to reduce parts, reduce cost, and save circuit board space. * The Inner Diameter is such that a lead of 1.2mm x 0.7mm can be inserted. * Recommended current value is a reference value calculated from the lead sectional area.